GSWA was formed in 1981 and since that time we have worked hard to establish the water quality standards for our watershed. Through our stream monitoring program and water quality testing, we are able to give you an accurate and timely snapshot of what’s in the water. 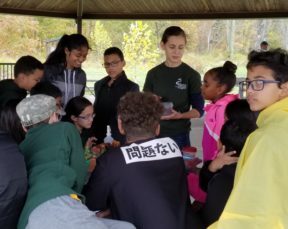 Since 2016, we’ve become the Passaic River Waterkeeper Alliance Affiliate and in 2017 expanded these test locations to include several sites further down the upper Passaic River. At the same time, plastic pollution gained widespread media attention as an emerging pollutant in our environment. The most striking example of macro plastics pollution (that is, large easily visible items) is seen in our oceans – with the Great Pacific garbage patch and marine wildlife entanglement. Then came microplastic pollution. First, beauty products were blamed as the public discovered that microbeads in personal care products were made of tiny plastic granules that were showing up in our waterways. Then, we started hearing about plastic bags, plastic bottle caps, and plastic straws breaking down and slowly killing marine animals. As scientists painstakingly gathered data about this pollution, we discovered that microplastics are not just limited to the oceans. New data has revealed that even fleece fabric sheds an astounding number of synthetic plastic fibers with each wash, adding another strain upon our rivers. It’s obvious, but you know how the old saying goes. Since GSWA is a leader in establishing water quality protocols for our watershed, we must expand our water quality data to include this disturbing new pollutant. There are certainly microplastics in our very own streams but just how much? That is the question we seek to answer. At the end of November, our first round of microplastic sampling is well underway. Lead by our WQ Director, Sandra, education associate Adam Palmer, intern Chris Gocklin, and our tireless volunteers; John Kramer, Kathy Schwartz, and Cathy Lee have been out dipping their nets and sampling the test sites for our first ever microplastic sampling run. “You can actually see little shreds of plastic this in jar” Sandra didn’t mince words after she returned from her first sampling run. The discovery of new scientific insight is exciting, but it belies a disturbing fact: there are pollutants in our streams that had gone undetected. Microplastics Sampling: How do we do it? Starting in November, we are conducting a preliminary, baseline study for microplastics. 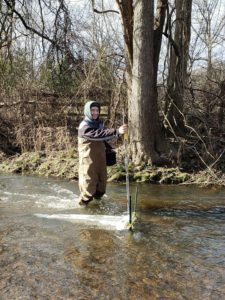 Our data will come from all four tributaries of the Passaic River in the Great Swamp Watershed, as well as the headwaters of the Passaic. 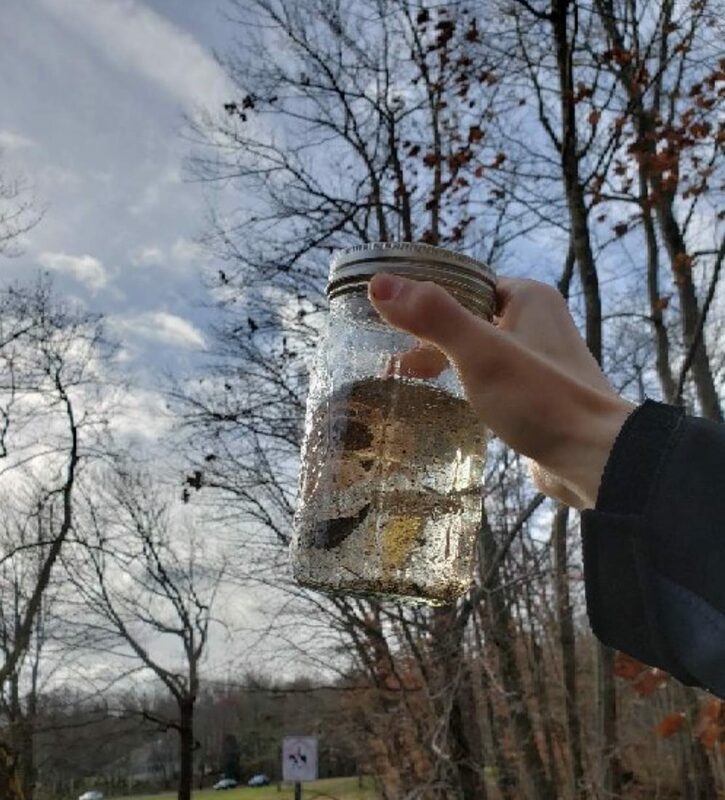 In line with our chemistry sampling, we will also be sampling for microplastics in areas of the main stem of the Passaic River area, including the Berkeley Heights area, where elevated levels of microplastics were found by NY/NJ Baykeeper. 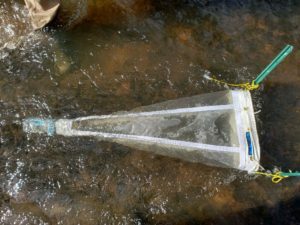 This net is designed to gather any debris floating through the water for analysis. Starting in the Spring of 2019, we will choose eight to ten sites to conduct a more in-depth study. Samples will be collected twice at each sample location, once in dry conditions and once in wet weather conditions. These samples will be collected in conjunction with Rutgers University, with one of their environmental studies students as a member of our regular sampling team. With this more extensive study we will be better able to quantify the microplastics in the sample locations, and begin to build a data base of the amounts and types of plastics found in these areas. Want to become involved in our project? If you want to be at the forefront of gathering this important data for your community, please contact Sandra LaVigne for information on how you can help. If you are a community leader, please reach out to us about scheduling public information sessions by GSWA to help your community understand this pressing environmental issue and how we can all make strides in improving the water quality of the Passaic River, the source of drinking water for over 1 million New Jersey residents.